Scott Hill, 25+ year small business veteran, shares his experiences, stories, and lessons learned from being a founder, buyer, seller, business broker, investor, franchisee, and consultant of small businesses in over a 1/2 dozen completely different industries. He's had wins and losses. He's got the scars to prove it. The show is focused on helping people buy and sell existing small businesses ("main street" businesses with less than $1,000,000 in annual revenue that make ... See More up close to 90% of American businesses). 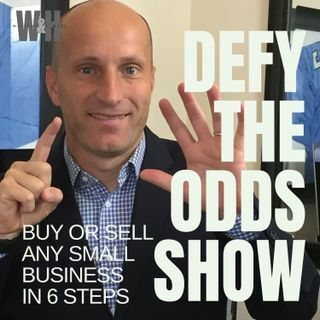 Scott uses his proprietary 6 step process he's developed over the years to dramatically improve your odds of either buying or selling a small business. Did you know less than 30% of businesses ever sell? The rest fade into oblivion or get transferred for next to nothing. Did you know close to 90% of aspiring business owners, who say they want to own a business, never do despite a recent Vistaprint study saying 62% of American adults would rather be their own boss?! Do you know why? Scott does...through personal experience. He also shares practical information and know how so you'll have the confidence and knowledge to pursue either buying or selling a small business. You need a plan. Scott has one. Go ahead...Live your American Dream! It starts here. Are You Buying Or Selling A Small Business? DTOS #12 - Ready To List Your Small Business For Sale? DTOS #11 - How Does A Business Broker Work? DTOS #9 - How I Started A Small Business, Bought It, Sold It, Helped My Mom Buy it, and Contemplated Buying it Again!